I know I haven’t been posting as regularly but I can’t help it because I’m so swarmed with school work and what not. There’s so little time to do what I want, and that includes baking and cooking! 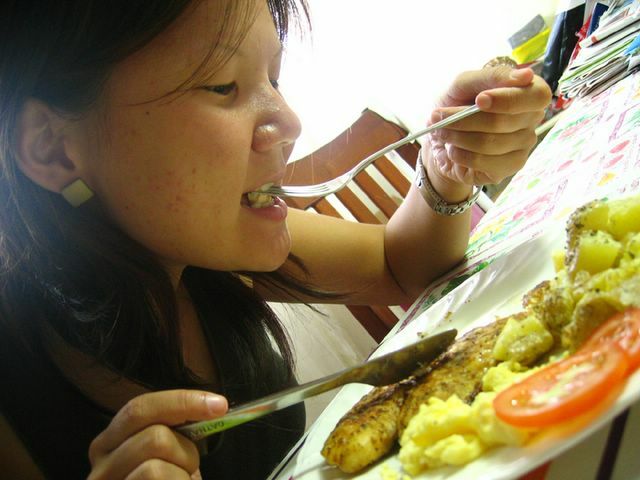 But I seized the chance to cook for Grace when she came over to my place to study that day. 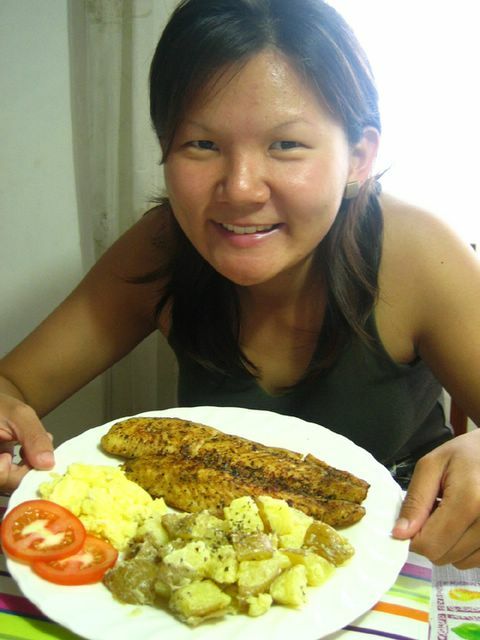 As you can see from the above, she looks happy with the lunch I cooked just for her! Here’s a candid shot of her enjoying the food. Well she did like what I whipped up. So that’s a good sign I hope? haha. 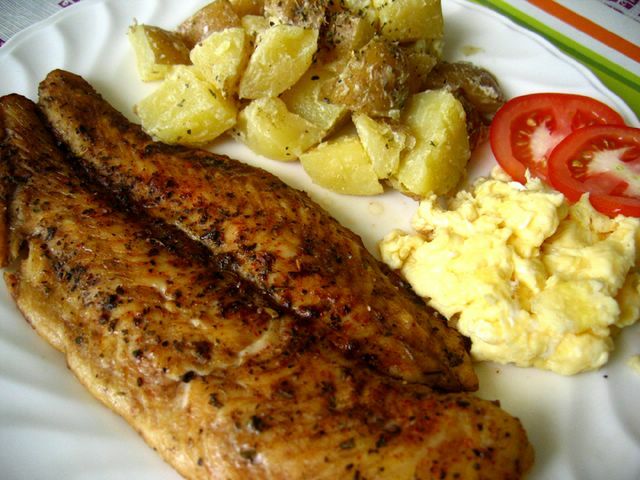 Here’s a closer shot of the lunch I cooked: Grilled Dory Fillet with Buttered Potatoes and Scrambled Eggs. It isn’t much, but it’s not too bad, considering that I did it impromptu. Didn’t follow any recipe, just went with my culinary instincts! 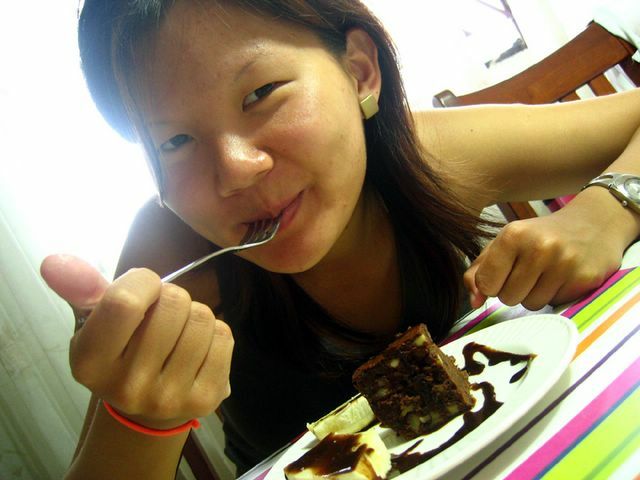 And of course, I won’t be known as the baker who cooks, if i don’t bake my signature brownies for my guest eh? 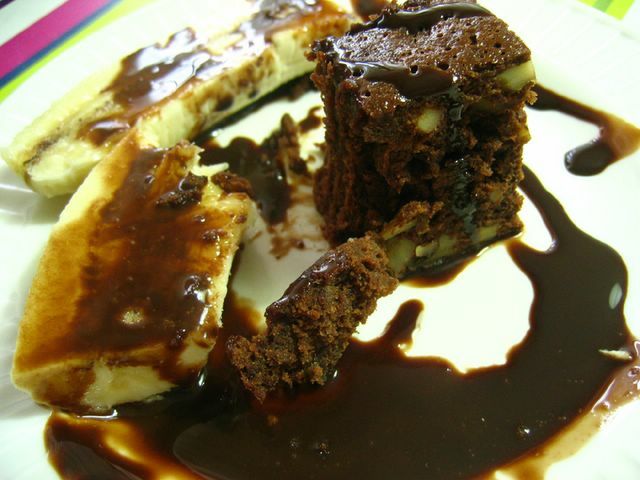 There’s no better dessert than freshly baked chocolate brownies with bananas, and drizzled with chocolate syrup. How’s that for an end to a home cooked lunch? Grace liked the brownies, as you can see. What’s there not to like about anything chocolate? Couldn’t resist taking a last shot of the brownies. Ahhhh I love baking!… and cooking. what would I do without a kitchen? What would I do without friends I can bake and cook for! This is the life. I know it’s crazy to be whipping up something in the kitchen when I should be glued to my books. But hey, we gotta destress ya? And my way of destressing is being in the kitchen, messing it up, and coming up with culinary delights. Wow, what a luxurious lunch, Cheryl. Hey, I wanna be your study buddy too! I’m a blogger myself from Holland and I like to bake and cooke. Wil you give me the recipe for the brownies ? what a treat for the babe! I wished Im over at yr place tooooo!!! Look yummie, can i have one? julia, we should do a pot-luck someday, with the rest of the floggers! I tried this recipe twice and failed. 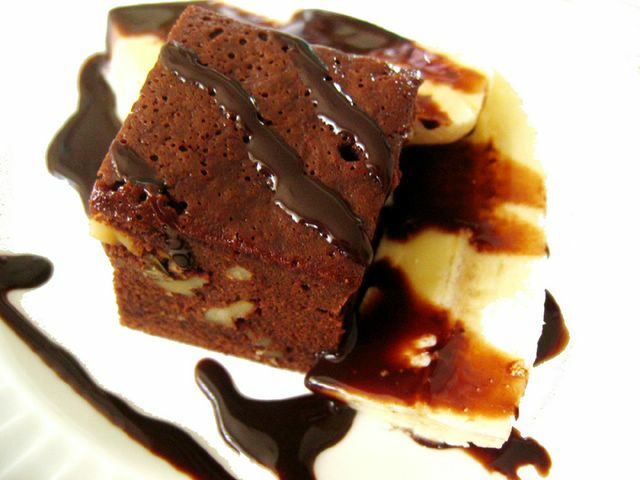 After baking, the brownie stick on to the pan and it is very difficult to take it out. I did grease the pan. Shall i line it? The brownie taste great and I really hope to master it.